Sensors are devices used to detect or sense the different types of physical quantities from the environment. The input could be light, heat, motion, moisture, pressure, vibrations etc… The output generated is usually an electrical signal proportional to the applied input. This output is used to calibrate the input or the output signal is transmitted over a network for further processing. Based on the input to be measured there are various types of sensors. Mercury-based thermometer acts as a temperature sensor, an Oxygen sensor in cars emission control system detects oxygen, Photo sensor detects the presence of visible light. In this article, we would describe the piezoelectric sensor. Please refer the link to know more about the piezoelectric effect. A sensor which works on the principle of piezoelectricity is known as a piezoelectric sensor. Where piezoelectricity is a phenomenon where electricity is generated if mechanical stress is applied to a material. Not all materials have piezoelectric characteristics. The commonly measured physical quantities by a piezoelectric sensor are Acceleration and Pressure. Both pressure and acceleration sensors work on the same principle of piezoelectricity but the main difference between them is the way force is applied to their sensing element. In the pressure sensor, a thin membrane is placed on a massive base to transfer the applied force to the piezoelectric element. Upon application of pressure on this thin membrane, the piezoelectric material gets loaded and starts generating electrical voltages. The produced voltage is proportional to the amount of pressure applied. In accelerometers, seismic mass is attached to the crystal element to transfer the applied force to piezoelectric materials. When motion is applied, seismic mass load’s the piezoelectric material according to Newton’s second law of motion. 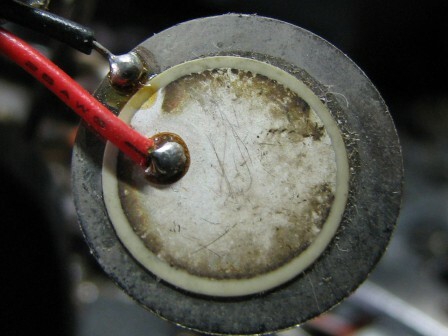 The piezoelectric material generates charge used for calibration of motion. An acceleration compensation element is used along with a pressure sensor as these sensors can pick up unwanted vibrations and show false readings. A piezoelectric sensor internal circuit is given above. The resistance Ri is the internal resistance or insulator resistance. The inductance is due to the inertia of the sensor. The capacitance Ce is inversely proportional to the elasticity of the sensor material. For the proper response of the sensor, the load and leakage resistance must be large enough so that low frequencies are preserved. A sensor can be called a pressure transducer in an electrical signal. Sensors are also known as primary transducers. The range of measurement: This range is subject to measurement limits. Sensitivity S: Ratio of change in output signal ∆y to the signal that caused the change ∆x. Reliability: This accounts to the sensors ability to keep characteristics in certain limits under set operational conditions. These sensors contain as Impedance value ≤500Ω. These sensors generally operate in a temperature range of approximately -20°C to +60°C. These sensors are to be kept at a temperature between -30°C to +70°C to prevent them from degradation. These sensors have very low Soldering temperature. Strain sensitivity of a piezoelectric sensor is 5V/µƐ. Due to its high flexibility Quartz is the most preferred material as a piezoelectric sensor. As we have to know what a piezoelectric sensor is, let’s look at a simple application of this sensor using Arduino. Here we are trying to toggle an LED when the pressure sensor detects enough force. Here the positive lead of the sensor indicated with red wire is connected to the A0 analog pin of the Arduino board whereas the negative lead indicated with black wire is connected to ground. A 1 MΩ resistor is connected in parallel to the piezo element to limit the voltage and current produced by the piezoelectric element and to protect the analog input from unwanted vibrations. The LED anode is connected to the digital pin D13 of the Arduino and cathode is connected to the ground. A threshold value of 100 is set to the circuit so that the sensor is not activated for vibrations less than the threshold. By this, we can eliminate unwanted small vibrations. When the output voltage generated by sensor element is greater than the threshold value the LED changes its state i.e. if it is in the HIGH state it goes to LOW. 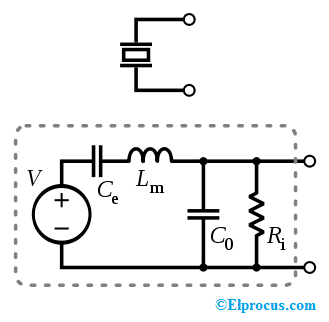 If the value is lower than the threshold LED doesn’t change its state and remains in its previous state. digitalWrite (ledPin, ledState); // the initial state of LED i.e. LOW. Piezoelectric sensors are used for shock detection. Active piezoelectric sensors are used for thickness gauge, flow sensor. Piezoelectric sensors are also used for ultrasound imaging. 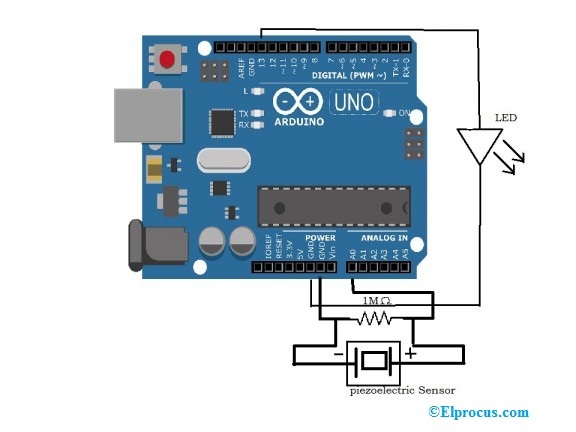 Thus, this is all about what is a piezoelectric sensor, properties, specifications and also simple interfacing of the sensor using Arduino board. These simple to use sensors find a place in various applications. How have you used these sensors in your project? What was the biggest challenge you faced while using these sensors?